A content management system is basically a piece of software that makes it easy for you to manage aspects of your website without needing to resort to custom coding everything. You can add content to your site just as easily as you can use Microsoft Office or Paint. While there are plenty of small differences, the core differences between the three come down to a balance between ease of use and flexibility. The numbers speak for themselves. That is, WordPress controls 59.4% of the CMS market for a reason. It’s easy to create content – if you can use Microsoft Word, you can create new content with WordPress. There’s tons of help material – because WordPress is so popular, you can find beginner-friendly help for pretty much anything about the content management system. It’s easy to add functionality – a huge ecosystem of plugins and themes (more on these later) make it simple to add functionality to your site, even if you don’t know how to code. WordPress is free – oh yeah, did we forget to mention that WordPress is 100% free? You may opt to pay for some extensions, but the content management system itself is always free. Web hosting – this is the engine that powers your site. It’s essential if you want other people to be able to access your site. We’ll cover your domain name below and then knock out web hosting in the next section! Memorable – you want your visitors to be able to easily remember your domain name so they can come back and visit again. Brandable – you want something that lets you create a brand, rather than just a generic name. Easy to pronounce out loud – if you choose a domain name like “go4ward.com”, it’s going to be a massive pain to tell people to use the number every time you have a conversation in real life. Trust us! A .com (if possible) – while it’s not as important to choose a domain that ends in .com as it once was, it’s still the most recognizable domain ending. Step 3: Choose and Sign Up For Hosting? Web hosting is what stores all the information about your site. Then, whenever someone from around the world wants to visit your site, your host serves up your site so that person can access it. There are a ton of hosting options out there, ranging in price from a couple dollars per month to thousands of dollars per month. 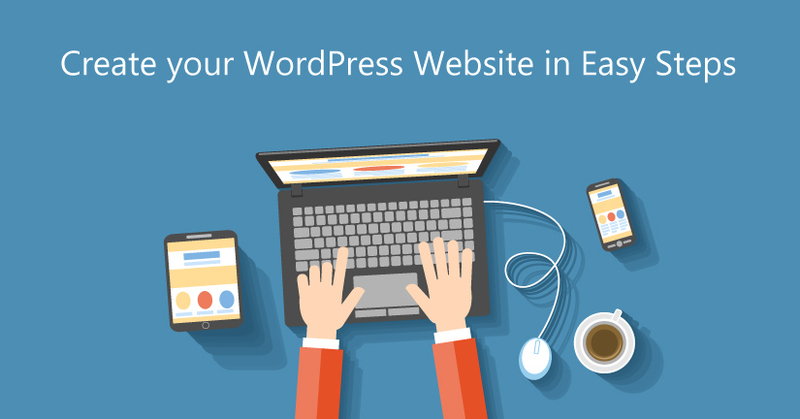 Most hosts have an automatic Wordpress installation, you do not need to download WP separately, just press a few buttons and your website is ready! Step 5: Install and Configure a WordPress Theme? WordPress themes are what allow you to change your site’s style. Think of them sort of like your website’s “clothing”. That is, themes change how your site looks on the outside, but don’t change the core content or functionality underneath the theme. There are two ways to install WordPress themes. The method that you use depends on where you found your theme. If you found your WordPress theme at the official WordPress.org theme directory, you can install it right from your WordPress dashboard. If you purchased a premium theme or found a free theme somewhere else, you’ll need to install your WordPress theme by uploading a ZIP file of your theme to WordPress. At this point, you’ve got a functioning WordPress site with your very own theme. Now, you’re ready for the fun part: Adding content to your WordPress site. After all, your site isn’t very helpful to visitors if there’s no content! Posts and pages both offer the same basic options, but you should use them differently. A post is basically like a blog post. That is, it will have a “Publish date” and show up in in a reverse-chronological list on your blog post. A page, on the other hand, houses more permanent information like an About page or a Contact page. Out of the box, WordPress is pretty much set up and ready to go. But that doesn’t mean there aren’t some small things that you might want to change. For many of those changes, you can use the Settings tab in your WordPress dashboard. Plugins are another type of tool that help you extend WordPress. Unlike themes, which primarily make style changes, plugins are all about adding new functionality to your WordPress site. That functionality might be something small, like a contact form or a new button, or it might be something massive, like turning your site into an eCommerce store or a social network. Basically, plugins unlock new features without requiring you to know anything about code. They’re pretty awesome! We hope you enjoyed this guide. And we just want to congratulate you one more time on learning how to make a website with WordPress!